DA Form 7206 or the "Application To Perform Legal Assistance Work For Retirement Points And To Be Listed In The Jagc Officer Legal Assistance Directory" is a Department of the Army-issued form used by and within the United States Military. The form - often incorrectly referred to as the DD form 7206 - was last revised on August 1, 2010. Download an up-to-date fillable DA Form 7206 down below in PDF-format or look it up on the Army Publishing Directorate website. 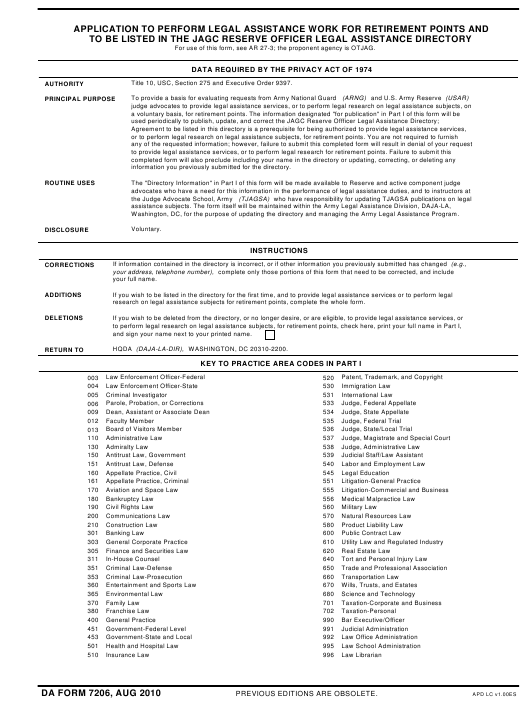 For use of this form, see AR 27-3; the proponent agency is OTJAG. Title 10, USC, Section 275 and Executive Order 9397.
information you previously submitted for the directory. Washington, DC, for the purpose of updating the directory and managing the Army Legal Assistance Program. research on legal assistance subjects for retirement points, complete the whole form. and sign your name next to your printed name. HQDA (DAJA-LA-DIR), WASHINGTON, DC 20310-2200.
of all courts before which I have been admitted to practice.